For those keeping score at home, this one should go right after Straight Out The Jungle, kicking off 1989. Remember Young MC? Or better question, remember the crossover rap hit “Bust A Move”? This one song defined his rap career so much his grave marker should read “He Busted A Move”. Ironically, he is also responsible for two other monster crossover rap hits from the eighties. 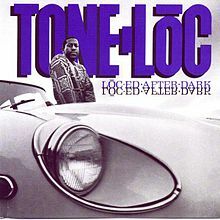 Young MC also penned “Wild Thing” as well as “Funky Cold Medina” performed by today’s subject Terrell Smith, better known to the world as Tone-Loc. Tone-Loc grew up in the mean street of L.A. where he was involved with gangs and other mischievousness. One day he realized the path he was on wouldn’t have a happy ending, so he decided to focus his energy on something positive and decided to pursue a career in hip-hop. He linked up with Mike Ross and Matt Dike, founders of an up and coming label Delicious Vinyl where he would release his debut album Loc-Ed After Dark . On the strength of “Wild Thing” and “Funky Cold Medina” Loc-Ed After Dark was a huge success as it moved well over 2 million units and provided two mash hits that over 20 years later still get played regularly at bars, bowling alleys, and radio and club’s old school hours. I ran across this one in the 99 cent bin at a local used record store and thought I’d give it a listen, to see if our Loced friend had more in his arsenal than just the monster hits that he didn’t even write. Random Factoid: Tone-Loc guest starred in an episode of Living Single where he played Kyle’s old high school bully, Lester Tate (Season 4, Epsiode 8: School’s Out Forever). On Fire (Remix) – It’s kind of weird to start an album out with a remix, but that’s just what Anthony decides to do on Loc-Ed After Dark . The Dust Brothers (responsible for the production on The Beastie’s Paul’s Boutique ) get a co-production credit, and turn in a decent instrumental for this remix. This was decent start to the show, but it left me curious on what the original mix sounds like. Wild Thing – I don’t think there’s a set of ears in America (and possibly the world over) that doesn’t recognize this song the moment the guitar licks kick in at the beginning of this ode to America’s favorite pastime: baseball. This song has been way over exposed since it’s release, so you probably hate this song by now, and I can completely understand where you’re coming from. I still think it bangs. Sick bass line, hard guitar licks, and Tone’s smooth gravelly voice are all in sync on this banger. Loc-ed After Dark – Over a subdued instrumental Tone drops his best battle lines on this title track. His rhymes aren’t terrible, but they don’t stray far from mediocre. Battle rapper, he is not. I Got It Goin’ On – This Matt Dike produced instrumental borrows from the classic “Jamaica Funk” record. Unfortunately, all the funk in Jamaica couldn’t save this song. Cutting Rhythms – The Dust Brother’s instrumental samples the classic Barry White record “I’m Gonna Love You Just a Little More Baby” (which has been used on several other hip-hop songs over the years). I loved the cutting during the hook after the first verse. I’m kind of curious on why they edited all of Tone’s curses before this song but allowed him to drop an f-bomb on this one. This was okay, I guess. Funky Cold Medina – If it aint broke don’t fix it: This was Loc’s second mammoth single from Loc-Ed After Dark , which uses the same formula used on “Wild Thing”: bangin’ bass line, rock guitars, and playful lyrics. This one is not an ode to baseball, but instead an ode to the drink that will make the ladies want to play baseball with you. I’m pretty sure this is Darren Sharper’s favorite rap song of all time. The Matt Dike/Mike Ross instrumental doesn’t quite bang like “Wild Thing”, but it’s still decent. Next Episode – This Dust Brothers instrumental was pretty underwhelming and this song made me want to move on to the next episode as soon as possible. Cheeba Cheeba – I think you all are smart enough to figure out what this song is about. Tone does a decent job over this laid back funky Dike & Ross/Dust Brother collaboration. I chuckled a bit when Tone replays his buddy getting the munchies after a smoke session. It was pretty ironic to hear him shout out who he refers to as “the king of late night” David Letterman, since this song is 25 years old and he just recently announced his plans to retire, long after Anthony’s 15 minutes begin and ended. Don’t Get Close – This Dust Brother’s instrumental sounds darker than anything else on Loc-Ed After Dark . Tone uses this dark instrumental to send out a warning to all competitor’s to keep their distance. You won’t remember any of Tone’s rhymes but this instrumental will stick to your bones. Loc’in On The Shaw – A Matt Dike instrumental that I believe is dedicated to the hood famous Crenshaw strip in Los Angeles. The Homies – At first seeing the title I assumed this would be a posse cut for Tone and his boys (who never thought about rapping before Tone got a deal, but suddenly got the rapping bug once he got signed) to spit over. Instead it Anthony displaying his love and appreciation for the homies. The results were lackluster, but his heart was in the right place. Loc-Ed After Dark works well when Tone recites his laidback-playful-rhymes around lighthearted subject matter. The problem is these songs only account for two of the albums 11, and an even bigger issue is they aren’t Tone’s rhymes but Young MC’s. The majority of the rhymes Tone did write are battle rhymes that hit about as hard as Richard Simmons punching a pillow. With the exception of a few, the production is lackluster. None of the instrumentals are outright terrible, but only a few have any lasting value beyond one listen. In a nutshell, Loc-Ed After Dark is two hit singles wrapped around an abundance of mediocrity. At least he can say he’s not just a one hit wonder. Or can he?